Krishna Sakti Ashram, Campos do Jordao, Brazil. 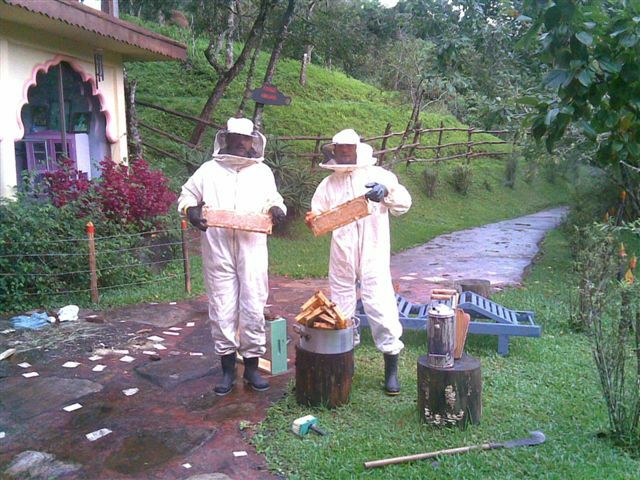 Sripad Trivikrama Maharaj and Rodrigo after the work of collecting honey from the Ashram's own beehive. They are following in the footsteps of Hasyapriya Prabhu of the Soquel Seva Ashram, USA, to please Srila Gurudeva and all the Vaishnavas through this service. This is the first time they have collected honey -- and gathered approximately 10 kg from just one beehive.